His smooth speaking skills and ability to caress the townspeople’s egos play in his favor. But there is an obstacle in his was, the pretty, uptight, and austere librarian, Marion (Shirley Jones). She is smart and far too cultured to be in such a town. She lives with her mother, an old Irish widow (Pert Kelton), and her other son (and supposedly Marion’s brother) Winthrop (the adorable Ronny Howard). Her primary responsibility is maintaining the library but she also works to instill a sense of culture and refinement in the farmer folk. There’s not much else to tell about the story. Hill’s attempts to woo Marion end predictably and sweetly, though the age difference is slightly disturbing. Preston’s skill at the role is unquestionable. His lines flow from his lips as smoothly as if he were an actual salesman. His body language is impressive, perfectly embodying a capable con man. Howard, too, is adorable. His lisp is generally convincing, an amazing feat for a seven year old. Jones is attractive but simple, and ultimately plays a dull character very straight. There are some entertaining song and dance routines. The larger ones involve the majority of the city’s denizens and are well choreographed. The best song involves the Iowans discussing their cold and stubborn disposition. An intricate romantic sequence in the library is nicely designed and visually impressive. The production design and aesthetic are convincing, with large street scenes filled with period detail. These small bright spots are not enough to recommend the film to anyone but die-hard musical fans. With a running time of 151 minutes the film drags on interminably. The story, which takes all of a few paragraphs to describe, does not require two and a half hours to tell, even with the aid of several extended musical numbers. Some of the musical numbers are themselves eternal, especially several dull sequences involving Marion’s romantic songs. It is necessary for me to confess that I am not particularly musically inclined, so if the songs are pure genius I would not be able to tell. As a device within a film, many of them fail. Another problem arises with the lack of interesting or credible characters. Outside of Hill, no one is very interesting. They are dull and uncultured Iowans, as they themselves profess. The presence of much cheesiness and unconvincing character changes add to the film’s problems. Fans of mainstream musicals may enjoy the movie, but most others will be dreadfully bored. I don’t mind most musicals. Classics like Singin’ in the Rain are treasures, and even some of the simple Ginger Rogers/Fred Astaire outings have been entertaining and enjoyable. But The Music Man is bloated and unpleasant, boring and dull, and a few engaging sequences are not nearly enough to save it. My wife and I just had the opportunity to see the stage musical in Columbus, Ohio, performed professionally. It was refreshing to have the characters feel alive, and have the songs snap and crackle more than in the film. The story is still weak, but as it is a musical I doubt many musical fans would complain. Most impressively, the musical ran for a bit over two and a quarter hours, with an intermission. How on earth did the movie get so bloated? Did they add additional dullness to pad it out? 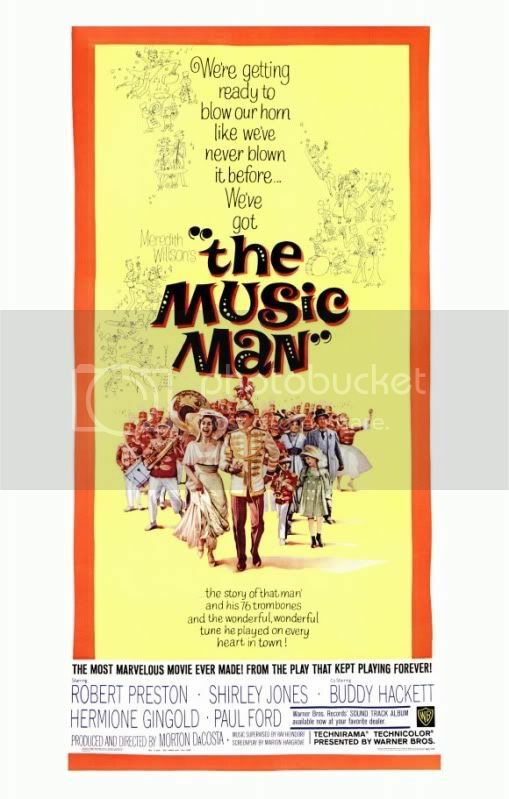 The Music Man should be pursued on stage; adapting it to film while pretending it is still a stage play is a mistake, littered with countless overt juxtapositions (chickens eating alongside the gaggle of women chatting) that work less well on film than they would have on stage.